In Artists in Community International’s February 2014 saltpan visit, we introduced basic colour groups and geometric shapes then showed how artist Paul Klee used these shapes and colours to create his paintings. We took these concepts of colour and shape into creating beautiful flags to catch the wind of the desert. This time we began by reviewing shape and colour to refresh their learning and in readiness for a new project to start the following day. Not only was the community reviewing, we too had to relearn Gujarati words for the shapes, colours and numbers. Although there are now government-provided schools in the desert, they are not well regarded as places of educational excellence and we can see that the children struggle learning the particular characterists of each shape. Nonetheless, the children and their parents are keen to learn. It takes time and between physicalizing the shapes, and drawing them most understand them in the end. Before this project began with the children and parents, we had explained our ideas to Tariq using some previous examples. I was especially keen to show him the project TWO TREES, initiated by Gali Weiss that combined artists books with learning literacy. 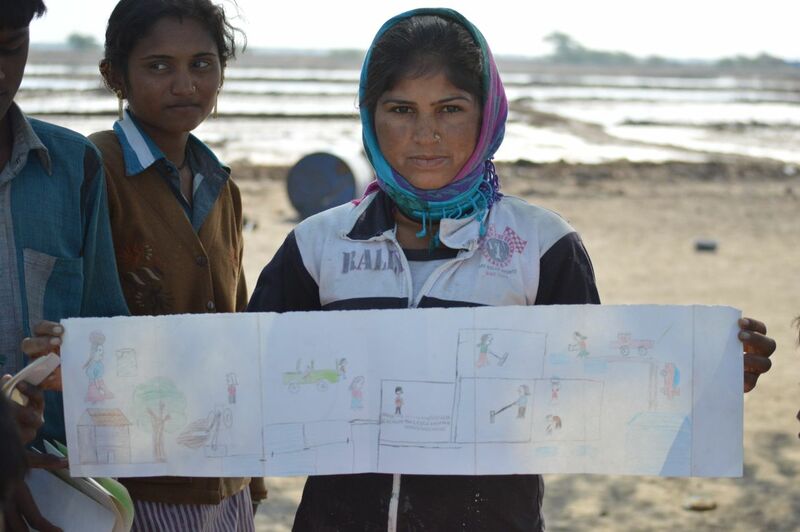 Our idea was that the books could be a way for the saltpan community to show some aspects of their lives. As a teacher, Tariq could see the potential in combining book and story as a creative, as well as educational, project. Alex worked with the group to dramatize their day-to-day life before we put these ideas onto the page. Part of our discussion with participant before starting the books was about narrative – this happens, then this, and finally that. Their drawings were naïve in many ways, but also clear in showing the steps involved in creating salt when you had an idea of the process involved. Their first books lacked a little pizzazz so the next day we began by first laying a wash of colour over the page before folding the book, then we added some beautiful hand crafted paper covers. With this, the books had a life and charm. Children and parents enjoyed making them and spent considerable time and effort on the details of their drawings. They were so immersed in their artwork that we both just sat on the bench and watched the books unfold. We also thank our many supporters, including MGIS and Desert Coursers, for providing funds to make this project possible. Artists in Community International donate our time and some costs to the project. Nice to see your work and the nice pictures of this so peaceful area. It’s easy to understand your will to help this people. You contribute to make their reality known.